My father was the photographer. He loved cameras, although he never really had enough money to get a really good one. 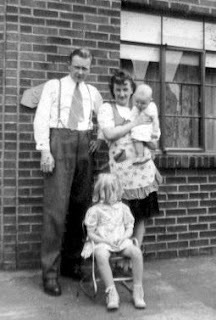 As many families of the 1950’s, we had the Kodak Brownie camera when I was very young. I know that is must have been used because I saw the proof of the old pictures in my parent's photo albums. So it was cheap, it worked and thank goodness, it gave us some memories to see what it was like when our parents were very young. Eventually, someone at the car dealer where my Dad was a salesman, sold him a second hand 35mm camera with extra lenses and buttons and dials... and lord knows what else it could do. We never really understood how to use all of it’s features, but my Dad and I would take long rides in the car just to take pictures of fall leaves. I used to like to go on these day trips, but as the day went on, I just wanted to get back home. Today, these are some of the fondest memories of doing things with my Dad. He would always have the pictures developed into slides and we would show them for hours to the family on special occasions or when we had taken a bunch of new ones. Most often, family members would find themselves head bobbing and nodding off. Who knew they would love the endless slides of Pennsylvania Turnpike Tunnel pictures... all 7 tunnels... both ends. We would pull off the side of the turnpike before each tunnel, take a picture and then pull off on the other side as we came out of the tunnel. We thought they were great when we took them, but even we would become sleepy watching them. For some reason, the pictures in the slide projector carousel were always quite out of order, causing to go from winter scene to summer to someone’s birthday, to the swimming pool. Everyone would complain about this disorder, especially my mother, but if it were not for the humor of this, we may have never actually made it through the entire slide show without falling asleep. Post any comments you have about your memories of family pictures!